The full run of Society for Industrial Archeology newsletters, from 1972 to early 2016, has now been digitized and is now available to download in PDF from from the SIA web site. Up until now, scattered issues have been posted to the web site. The collection is now comprehensive. 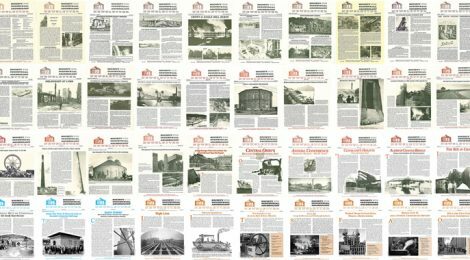 Collectively, these publications form a retrospective of the Society’s interests and activities, tracking its role in cultivating understanding of and appreciation for the industrial heritage of North America and, occasionally, further abroad. The newsletters indirectly chronicle more than four decades of de-industrialization in the U.S.A., Canada, and beyond. Many of the newsletter’s front pages from the 1970s are taken up with accounts of industrial structures falling by wrecking ball or arsonist’s torch. These early issues also chronicle efforts by the SIA and other groups to stem that tide through industrial heritage preservation initiatives. Throughout the decades, there are descriptions of archeological excavations and site surveys, features on machinery or industrial facilities, and accounts of SIA conferences and tours. The newsletters capture the broad range of interests within the Society’s membership: manufacturing and extractive industries, transportation, bridges, industrial architecture, industrial work skills, IA in art, metallurgy, etc. The PDF files themselves are somewhat ideosyncratic. Several of the files from the late 1990s and early 2000s, for example, were converted from pre-press files with the titling and other elements shown in bright blue rather than the SIA’s standard Pantone 1685-C (the color elements were rendered in blue so they wouldn’t show up on the negatives for the black offset printing plates). The text and imagery in some issues shows up more clearly than in others. All of the PDFs are searchable using standard PDF viewers.